It was a small group that turned out for a menorah lighting in Penticton Tuesday night, but that didn't dampen the spirits. It was a small group that turned out for a menorah lighting in Penticton Tuesday night, but that didn’t dampen the spirit of Rabbi Shmuly Hecht. “Tonight represents, in some way, the inner message of Hanukkah. It’s not about numbers. The Jewish people are the smallest of all nations … an error in a Chinese census could add up to all our numbers,” said Hecht. “It doesn’t matter how many you are, it matters about the contribution you make to the world. Hanukkah started at sunset on Dec. 24 this year, making the event on Dec. 27 the fourth night of the Jewish Festival of Lights, which traces back more than 2,000 years. But Tuesday also marked the first time a public event to light the menorah, a symbol of the celebration has taken place in Penticton. That was thanks to Hecht and Chabad Okanagan, an outreach organization that is taking the menorah to communities throughout the valley during the eight days of Hanukkah. In Penticton, they were hosted by Syril Victor and Lorraine’s Café. 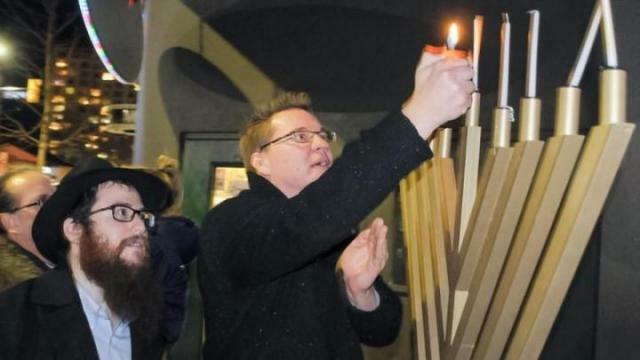 Mayor Andrew Jakubeit was asked to light the first candle for the night, which adds an additional light for each night of the eight days, commemorating the rededication of the temple in 165 BC, when a small amount of oil miraculously lasted eight nights to light the sacred space. “Mayor (meir) in Hebrew means bringer of light, so to have a mayor light the first candle is always an honour,” said Hecht.